Drunken & Deadly Horse Race Anyone? 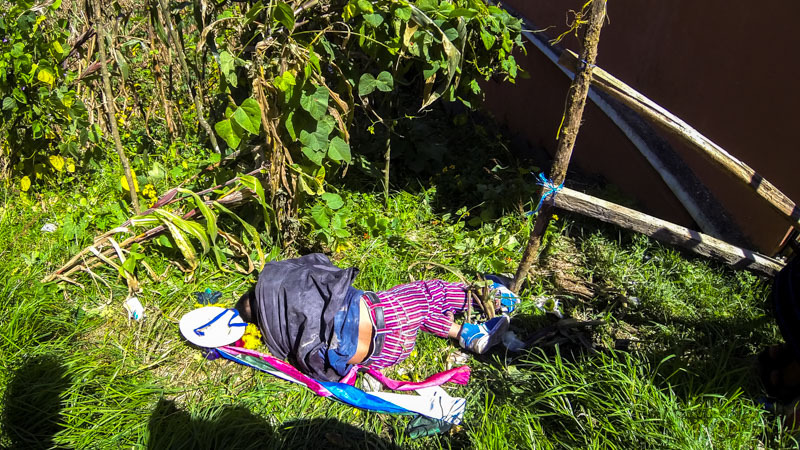 A description of and some practical information about the drunken horse race in Todos Santos, Guatemala – the strangest, most memorable Day of the Dead festival in Central America. 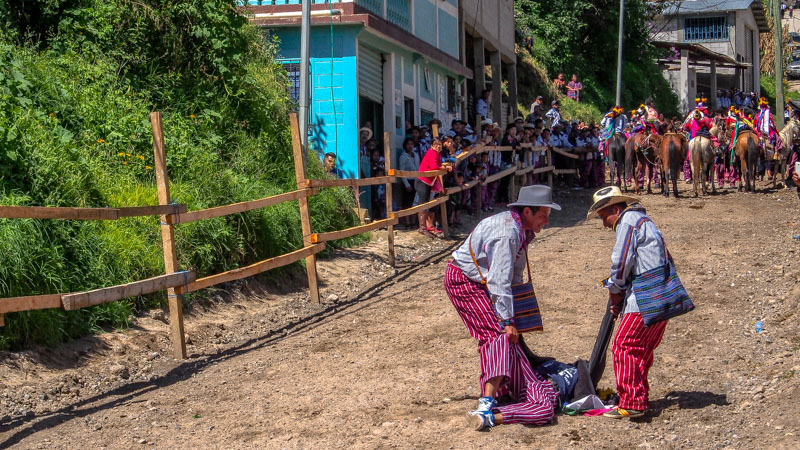 Every year on October 31st, a sleepy Guatemalan highland village by the name of Todos Santos Cuchumatán morphs into some sort of surreal cowboy-zombie movie. 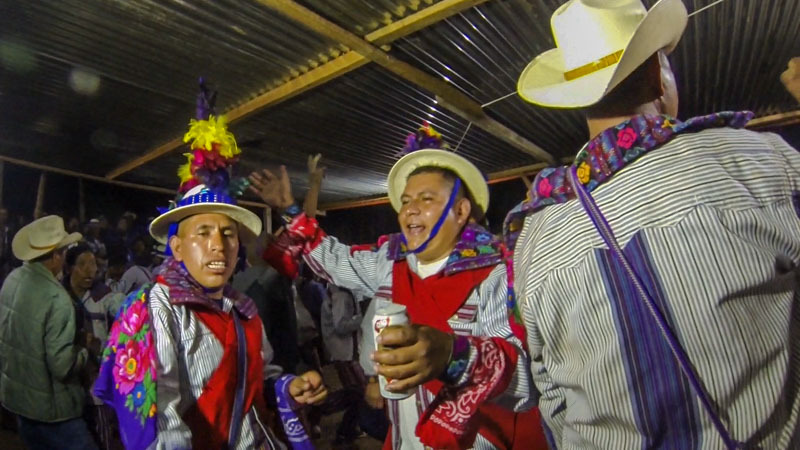 The streets fill with Maya men from near and far who journey to Todos Santos with the main purpose of getting absolutely hammered. For three entire days, benders that would make any British teen look like a Sunday school kid become the norm. 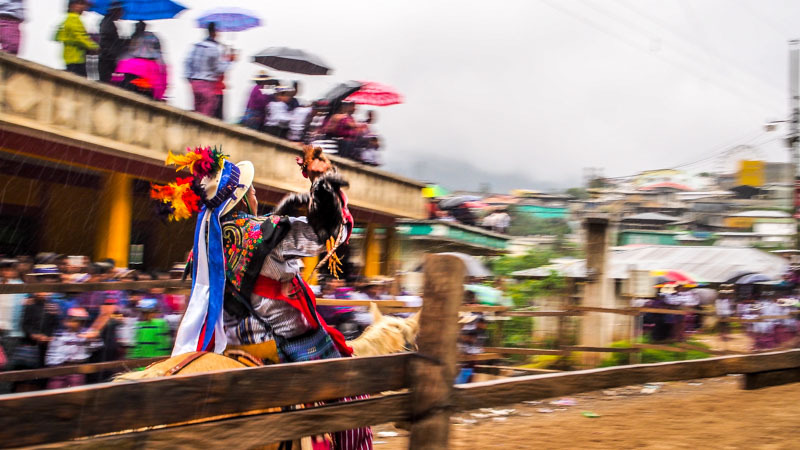 Hundreds of Maya men dressed in identical folk costumes dangle through the packed village, singing along to the cheerful tunes from the many marimba street bands, before jumping on a horse and frantically racing it through town. Now, in case you’re wondering if this really is as weird and epic as it sounds, the answer is: oh yeah baby! This is one backpacker experience in Central America you do not want to miss out on. 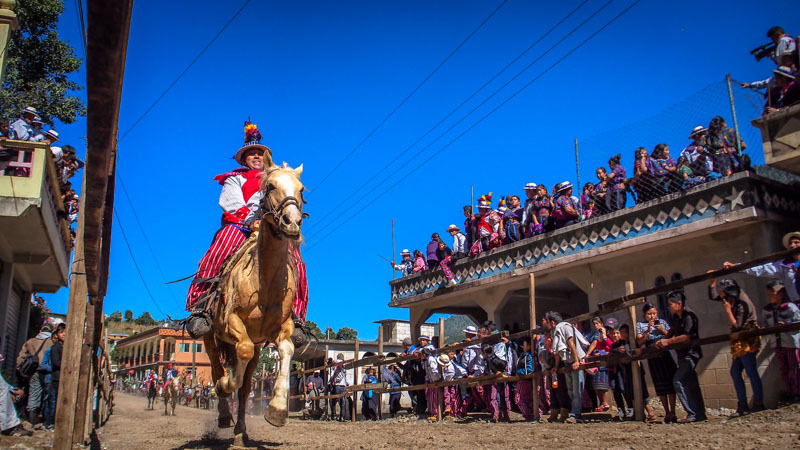 But don’t be fooled – although the drunken horse race is definitely the most famous part, there’s plenty of other Day of the Dead activities in Todos Santos that are worth checking out. 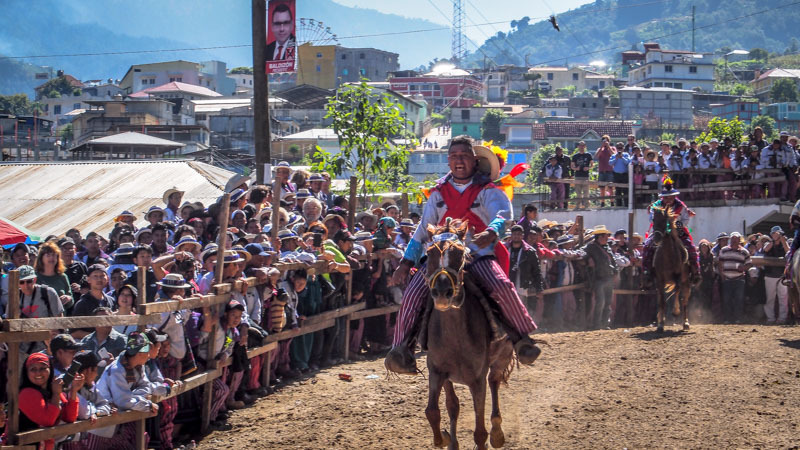 Keep reading to find out what those activities are, what the hell this drunken horse race is about and how to get to Todos Santos. Giddy up and prepare to be amazed! 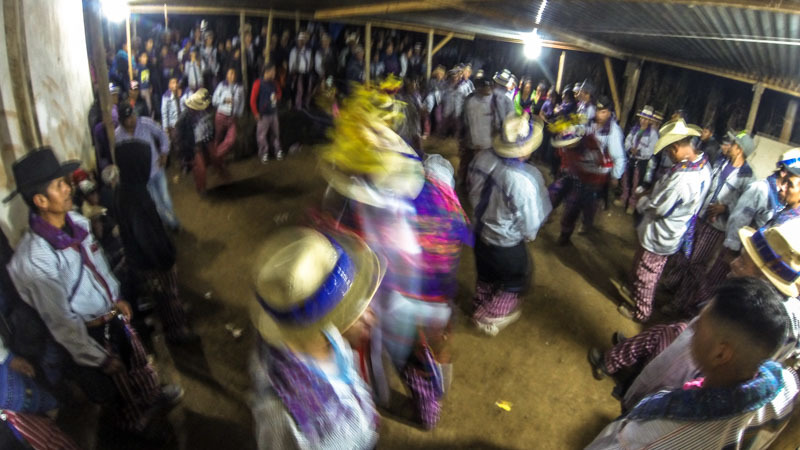 On the night before the race, Todos Santos explodes into a haze of beer-stained clothes, lighthearted drunkards, and exhilarating marimba tunes. Local families and drunk men alike wander the streets, stopping along the way to buy a toffee apple or perhaps a quick taco dinner in the small stalls spread out all over town. The fair just off the main pedestrian street is bathed in bright, blinking lights from a handful of beeping arcade games. However, the thing you’ll notice the most is the way the local men are dressed. Without exception, they all wear identical folk costumes consisting of red-and-white striped pants and a white, long-sleeve shirt with dark purple details and a sassy collar with colorful flowers embroidered on it. This traditional outfit is completed by a brimmed straw hat, but many guys tend to lose this accessory in the first ditch they tumble into. Around every corner, you’re hit by the alluring sound of laughter and animated conversations coming from Todos Santos’ many house parties. 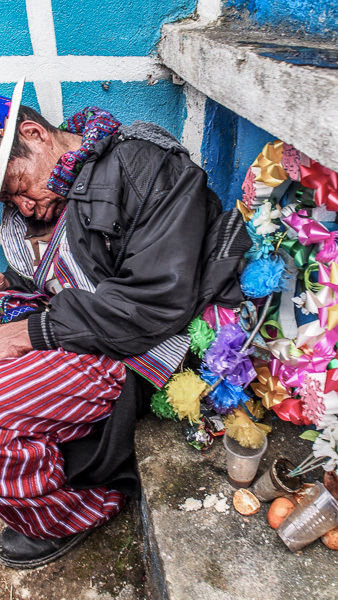 Backyards and alleyways equipped with improvised dance floors and the mandatory marimba bands attract streams of locals who spend the night hopping from one party to the next, bumping into old friends and chugging beer like there was no tomorrow. 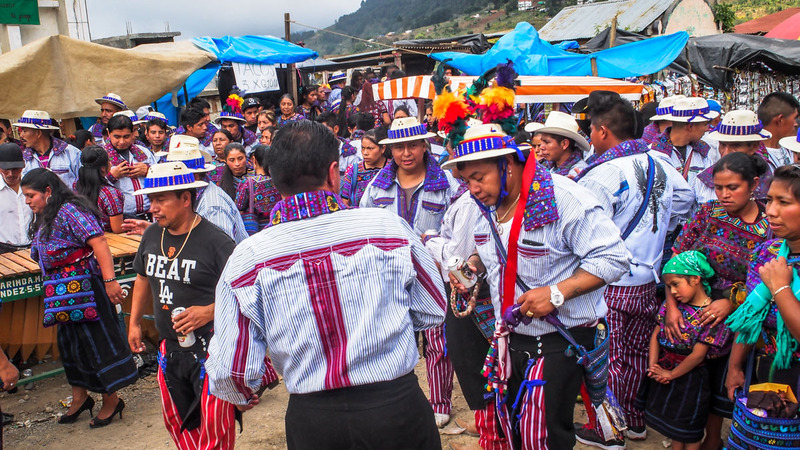 On the dance floor, the men of the village break out their best marimba moves, swaying heavily and regularly stumbling into each other, resulting in some disgruntled mumbling followed by more dancing. 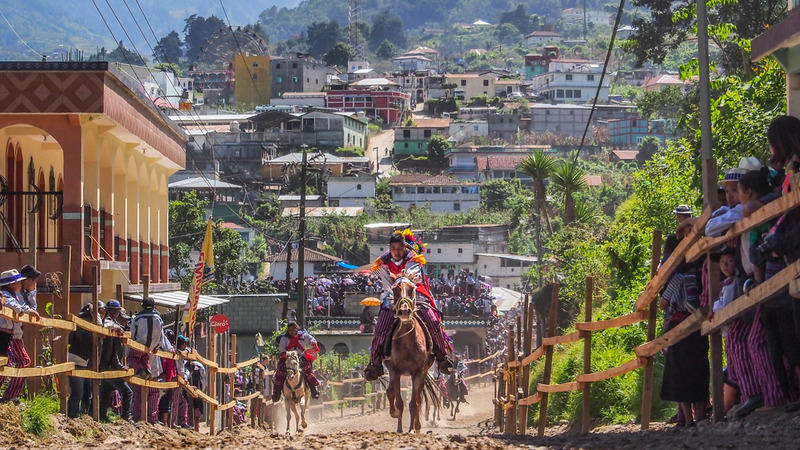 A few of the men stand out by wearing straw hats decorated with big, brightly-colored feathers which indicate that these are the riders for the following day’s drunk horse race. At a safe distance from the hectic dance floor, the women stand around, chatting cheerfully and taking care of the men that have succumbed to the dancing and binge-drinking frenzy. Handing out generous servings of hot soup from a few large cauldrons, the women make sure that everybody gets safely through the night. Early next morning, the village awakes to the sound of gunshots coming from the race track. Emerging from gutters and trenches, passed-out Maya men squint at the sun and join the continuous stream of people moving towards the outskirts, limping like hungover zombies. A dirt street about 100 meters long has been turned into a fenced-off race track and is flanked by loudly cheering villagers on both sides. Every few minutes, a group of six or seven horses thunder by, their hoofs kicking dirt and whooshing pebbles into the air. On the back of these muscular creatures glistening with sweat, the riders bump up and down in their saddles, bellowing out shriek war cries. Instead of keeping a tight grip on the reins, they flap their arms like manic birds, creating a sight that will stay printed in your memory for a long time. In one lap, the riders appear clinging on to a beer can, sprinkling their already stained outfit with more golden drops. In the next, they appear swinging a live chicken vigorously above their heads like a feathered lasso, prompting the spectators to explode in loud cheers. Every now and then, a rider slides out of his saddle, exhausted by the many hours of drinking, dancing, and drunk riding. Without the slightest sign of worry, a few spectators run onto the track and swiftly drag him to the nearest trench where he is left to sleep it out in the tall grass. As the hours fly by, more and more riders pass out, leaving only a handful still conscious in the early afternoon when the race ends and the spectators start seeping back into town. The rest of the day is less entertaining, with a considerable amount of the inhabitants way too hungover to even contemplate setting up a food stall or hosting a house party. Who The Hell Came Up With The Drunken Horse Race?! I know what you’re thinking – exactly how do you end up galloping pissed around on a horse in the first place? The story goes that back in the 1500s, the village of Todos Santos was occupied by merciless Spanish conquistadors who didn’t treat the locals particularly well. One day, a villager decided that enough was enough and proceeded to steal one of the conquistadors’ best horses. Instead of zooming out of there, he then galloped the horse around town as an act of defiance, finally getting killed by the Spanish after a frenzied, day-long chase. Ever since, the good people of Todos Santos have celebrated their ancestor’s bravery by reenacting the wild chase the day before the Day of the Dead. Since the race is a reenactment of the chase, it doesn’t actually have a winner and is, in fact, more about showing off how strong and courageous the riders and their families are by not demonstrating any fear while riding. On the third and final day of the Day of the Dead celebration in Todos Santos, the villagers pack a picnic basket with a few snacks and drinks and head to the graveyard to visit their loved ones. Being a holiday dedicated to honoring and remembering the dead, on the actual Day of the Dead, or Día de Muertos as it’s called in Spanish, all the families in the village gather to enjoy a peaceful lunch in the presence of their lost relatives. In the weeks leading up to this day, the villagers have flocked to the graveyard, painting their family tombs in bright and cheerful colors, leaving a truly magnificent setting for the family picnics. 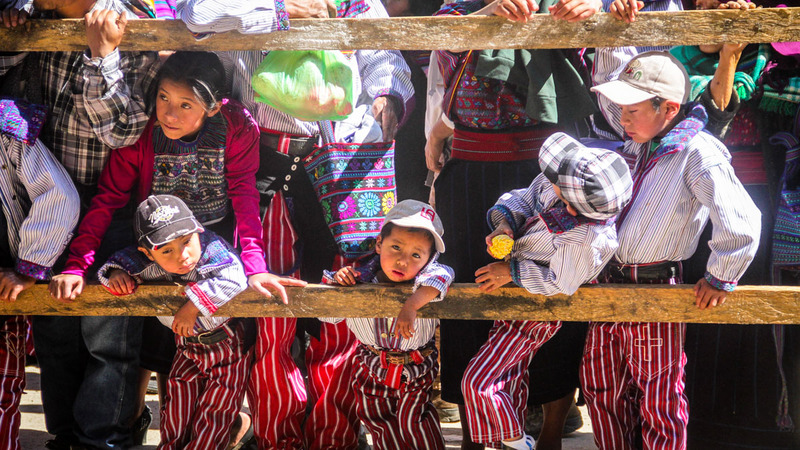 Zigzagging between turquoise, pink, purple, and green tombstones, children run around playing, their thrilled screams blending with the ever-joyful tunes of the marimba bands that are still sober enough to play. Here and there, a passed-out drunk guy is snoring away, resting against a random tomb like an unmovable sack of potatoes. And thus, three days of binge-drinking, equestrian madness, and nonstop partying come to an end under the hot Guatemala sun amid laughter and smiles. Hallelujah, it’s chicken bus time! There are no fancy tourists buses going to Todos Santos, so you’ll have to use local transport. Luckily, chicken buses are cheap, easy and safe – perfect for a budget backpacker! 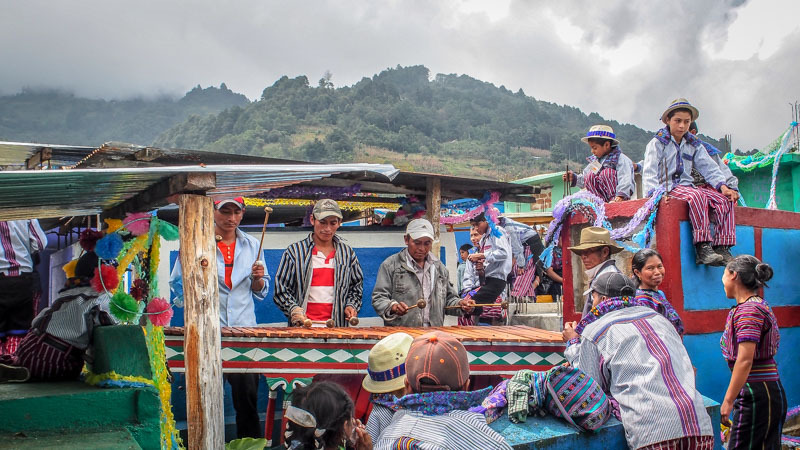 From Quetzaltenango (Xela), you take a 3-hour chicken bus to Huehuetenango. From there, you catch a 3-hour minivan to Todos Santos. The ticket price for the minivan is slightly more expensive than the chicken bus due to the demand and the village being a little out of the way. Teaser: the journey to Todos Santos is almost as big an adventure as the celebration itself, winding along narrow mountain roads and through tiny, remote villages. Todos Santos is a small village with limited tourism most of the year, so hotels book out pretty fast. Call to reserve a room a few weeks in advance to make sure there’s actually space when you get there. Plan to be in Todos Santos on the night of October 31st since this is – in our opinion – the most fun night. The drinking is only just starting, so the chance of striking up a conversation with the locals is higher than on the other days where the hangovers start to kick in. You can turn your visit in Todos Santos into a 6-day hiking adventure by joining Quetzaltrekkers on their annual Day of the Dead hike. 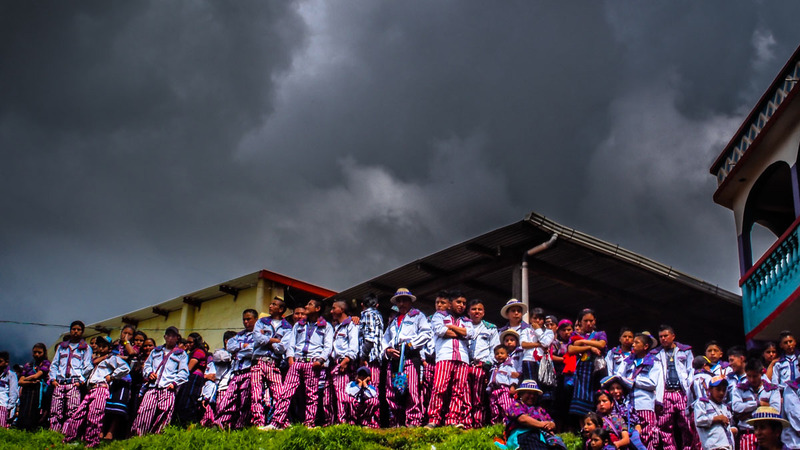 This is an entirely non-profit, all-volunteer run hiking organization that directs all its profits towards running a school and home for street kids in Quetzaltenango. Not only would you be embarking on an epic journey, you would also get the chance to help out Guatemala’s street kids – perfect! 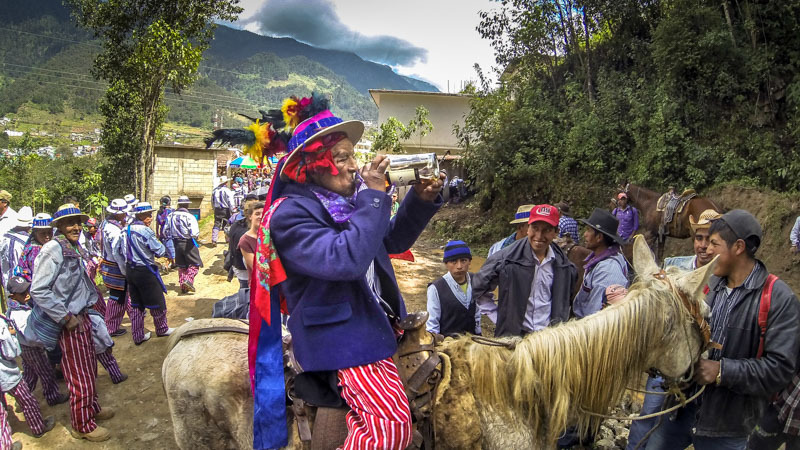 Which strange local celebrations have you bumped into on your travels? Did we forget something in the post? Or do you just want to say hola? Drop us a line – we love making new friends!